Studios comprise a single room with kitchenette and have 2 beds (which can be pushed together and form a double bed) and a sofa, with a normal bed mattress. They are spacious and comfortable and can accommodate up to 3 people (2 beds and the sofa for the 3rd person). The one bedroom aprtments have a separate bedroom with 2 beds (which can be pushed together and form a double bed), and a dining/sitting room with a sofa, with a normal bed mattress, and a single bed. They can accommodate up to a family of 2 adults (bedroom) and 2 children (living room) - one child on the single bed, the other on the sofa. The one bedroom apartments are suitable for families with 1 or 2 children. We don't recommend this option for 4 adults; in this case, please consider booking 2 studios. Baby cots are available with no extra charge. Daily maid services, except Sundays. Wired (high speed) & wireless Internet access. Breakfast, as we provide self-catering accommodation. However, since the supermarket is just across the street it is very easy and convenient to get everything you need for your breakfast. In addition, all the flats, apartments & studios, have all the necessary facilities (kitchenette, fridge, microwave oven, toaster, coffee maker) for self-catering. You can have breakfast at the pool bar; this opens a bit late though - 11:00 in the morning. Beach/pool towels. We provide towels for the room and we would appreciate it if you don't use these at the pool or the beach. Check out time is 12:00. If you need to keep the room until 18:00 you will be charged with a day use fee, which is 50% of the room rate. Should you check out later, the full daily rate is applied. Alternatively, we provide a shower room and luggage storage if you need a late check out and don't want to be charged with the day use fee. Time of arrival: We need to know your time of arrival, since we don't have a reception and we are not 24 hours available. However, if we know your time of arrival, we will be at the apartments to give you the key and show you into your room; we will be waiting for you at the pool bar. Check in/out day: At Lefka apartments, we don't have a specific change over day. You can check in and check out any day you want. Requesting a specific room: We don't have different prices between rooms facing the pool or facing the garden at Lefka apartments. Also, since we don't have a specific change over day (clients can check in and check out any day of the week) it is almost impossible to promise you that you will get a specific room. You can always state your preference for a room with pool view or garden view (or for a room at the ground or 1st floor), but for us it's impossible to guarantee that, just because we don't have a specific change over date. Of course, we will do our best to satisfy your request and give you a room of your preference; however this is not always possible. Therefore, when confirming a booking with such requirements the confirmation will always be under the "if possible" condition. No, since we don't have contracts with package tour operators or travel agencies. Guests at Lefka apartments are all independent travelers. The only way to book a room is directly with us. Number of persons (adults & children; include childrens' ages). Number and choice of room (studio or one bedroom apartment). Phone number (preferably your mobile number). Within 24 hours, we will reply to your request. If you do not receive a reply within 24 hours, we urge you to resend the or to give us a call as very often emails can, due to anti-spam programs and filters, be "bounced", meaning that we or you might not be able to receive them properly. In this case have a look at your "spam" or "junk" e-mail folder; you will most probably find our reply there. On acceptance of your booking you will be asked to pay the necessary down payment (25% of the total stay). If you need an urgent reply, you might find it more practical to call us directly using the phone numbers below. You can always reach us by calling our home number (0030-28210-33855) or our mobile phone (0030-6945-379552). Please, use common sense when using these numbers and avoid calling early in the morning or late in the evening, unless of course it's absolutely necessary. On acceptance of your booking and to secure your reservation, a down payment is required. The amount of the down payment should cover 25% of the total cost of your stay. If you have booked through our on line booking system then everything is fine since we have your credit card details. You can pay online using our bank's secure payment website. We will email you with the details as soon as you confirm your reservation. You can wire the money to our bank account. Bank account details will be available upon confirmation of the reservation. You can pay the balance, cash or with your credit or debit card, on your check in or one day prior to your departure. If you wish to sort out the balance prior to your arrival then you can do it by wiring the money to our bank account or with your credit or debit card. Bank wire expenses are covered by the client. If you cancel your reservation 21 days prior to your arrival then the down payment is refunded in full. Otherwise, the penalty is loss of the down payment. In case, you have prepaid the whole cost of the accommodation in full, then if the cancellation is made 1 month prior to your arrival, the amount is refunded in full. Otherwise, you are charged with the cost of the down payment (25% of the total stay cost) and the rest is refunded. When refunding, the cost of any credit card surcharges or bank wire expenses is yours. 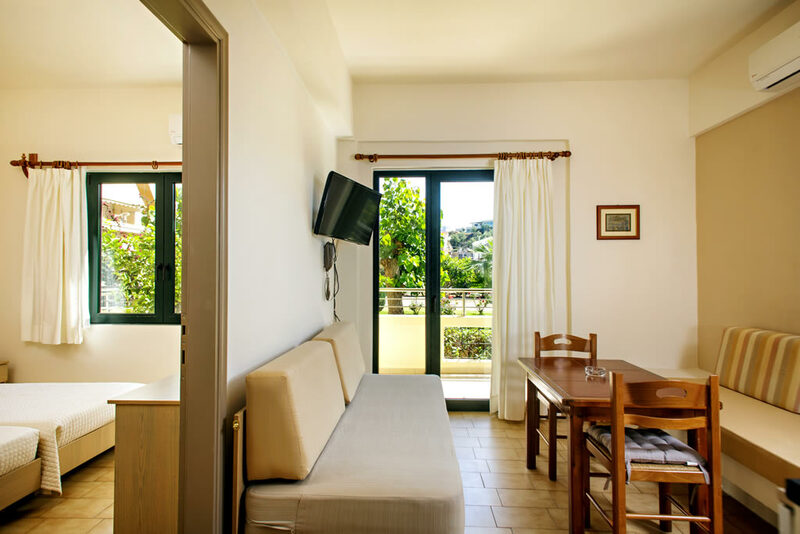 We would be very happy to host your holidays in Chania.